3 lives, difficulty B ("Medium"), extends at 70K and 200K. 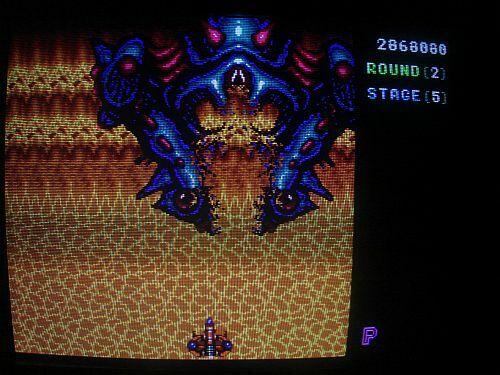 Versions of the game titled "Truxton" are generally easier. Strangely, the Mega Drive port is partially developed for PAL? I don't get it. Don't use 50Hz though. Note that an NTSC Mega Drive is still slightly faster than a hacked 60Hz PAL one. DETAILS is for which console or emulator, which region release, etc. 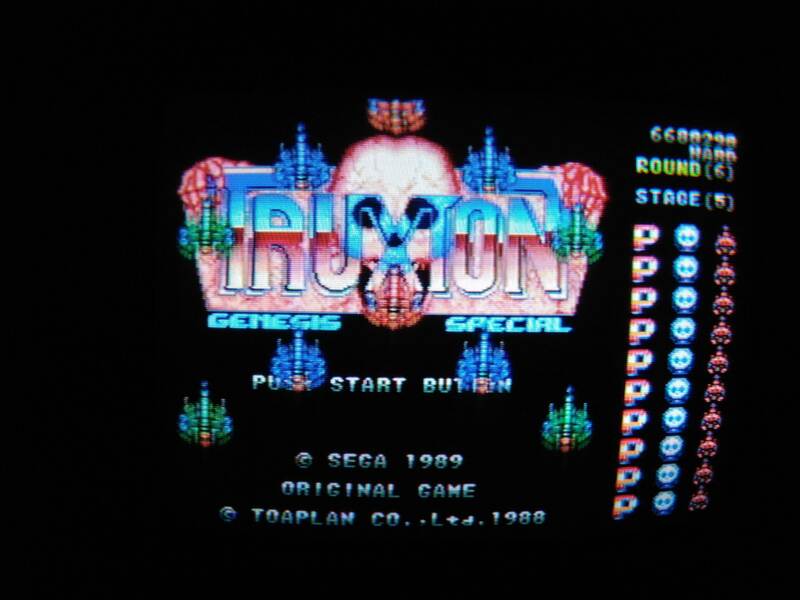 There may be differences between one "Truxton" version and another. In the ports, you can get a faster autofire with turbo switches. Please use "No"/"Off", "Yes"/"Int. ", or "Ext." (depending on the version) to denote what you played with. 16. SFKhoa - 300,060 - 87 - ?? - ??? 3. Mx7 - 1,367,810 - 1-5 - ???? - ??? 5. ChainsawGuitarSP - 497 600 - 1-3 - ???? - ??? 6. Andi - 393,850 - 1-3 - ???? - ??? 7. Ed Oscuro - 269,890 - ??? - ???? - ??? Last edited by Despatche on Tue Mar 19, 2019 5:19 pm, edited 31 times in total. Interesting going back to this game after a long absence from MAME and shmups generally. Had a 1LC before that but did horribly on the 2nd loop, losing almost all lives on the first boss. Interesting how flat the difficulty is on the second loop actually. Level 1 is hugely ramped up from loop 1, level 2 slightly less so, level 3 slightly less again, and so on. Once you get past the first couple of levels the rest is pretty familiar. Reached 21million on some crusty old arcade cab with poor 4-way joysticks. Shumps forum members ARK and ARM turned up as I was losing lives when the joystick retired (wouldn't move left direction). Score was only possible because I used max full firepower and speed-up only only used 2-3 bombs max for each loop (no bombs used during speed stage). Didn't bother change colour for 1-up during stages, just used the RED shot firepower from start-to-finish and gain as many 5k bonus. Can't remember the number of loops but more than 10 loops to reach 20million. You do know that this particular feat was downright dangerous for your health....nonstop, no end-stage breaks, to toilet breaks etc. The cab was in a local snooker club in Woolwich high street back in days when arcade cabs were more affordable in Libaries, Fish & Chip shops, Off Licences. Don't think shumps members ARK and ARM, even knew the game was there as their sole interest was just visiting the club to play pool/snooker. 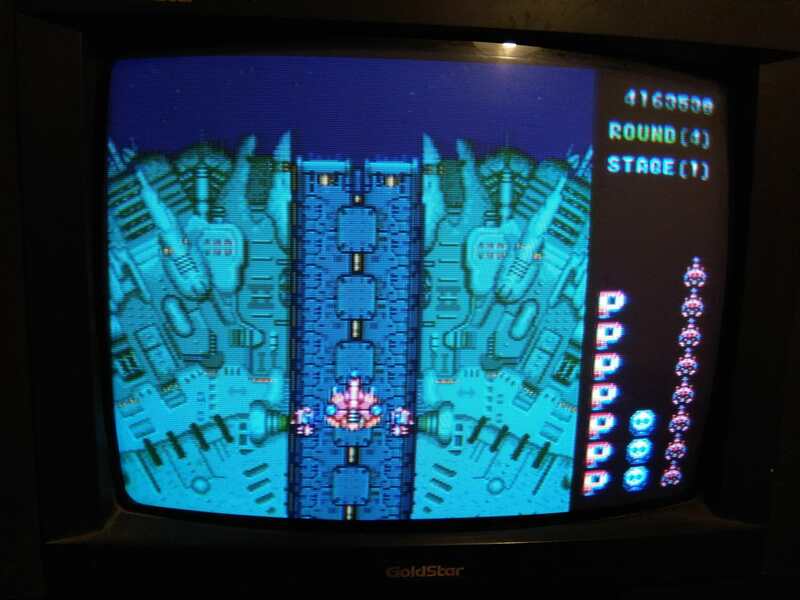 Remember top japanese player SHIN, during his 1st few years living in London, stated that the harder Japanese version of Truxton ends at stage 999 or 10million. I wonder what happened to that rare Truxton prototype pcb in Goodge St which featured RED lazers instead of BLUE? The game loops forever just like Truxton does; it's just that world records in Japan stop counting beyond 10 million for many older infinitely looping games, so that people aren't playing for days on end. Had an almost exemplary first loop only to get lammed by the second loop. The increase in enemy aggression is fairly cruel. Managed to recover splendidly just before the fourth boss, but forgot the enemy that materialises from behind. Fought valiantly with just the regular vulcan and defeated the boss, only to get cornered by the lightning-fast bullets of the swarming goons that accompany said boss. 'Tis a shame to spoil forthright and heroic prowess like that. So close this time! Maxed out the speed ups in order to pocket all those precious points. It feels stupendously natural to play the game at a breakneck pace, although one has to know what is coming up so as to prevent slamming into enemies. 'twas a pleasure. Certainly not a consistently great run (some mind-boggingly dumb deaths, picked up the green laser in the final stage), but it finds a good balance between the outrageous mistakes and the heroic recoveries, I think. Tatsujin has some of the most exciting checkpoint recoveries in the genre in my opinion, some spots are plenty tough, but none of them is insurmountable. I do have the opinion that it makes quite a difference whether you played Tatsujin or Truxton, though. Just like with the sequel, enemy resilience can make a big difference, and subsequent loops get a lot more nasty early on. If you can get 10m and more in Truxton you'll surely be able to do something similar in Tatsujin, no doubt, but generally speaking it is important. I'll also say that the PCE port is probably my favourite version of the game. I like the more powerful bombs of the ports (since the screen is much smaller you'll almost always will hit (mid-)bosses with it) and the PCE version is demanding from start to finish without any lulls or extreme spikes like the MD port. Can someone advise me whether it's possible to switch my board to Truxton without actually modifying the PCB? Don't remember the last 3 digits but that will do. A pretty nice port, but the first 4 levels are a bit easy compared to the spike that is level 5. Second loop seems more interesting in the first levels. Cleared it with the last life! first death was in stage 4 boss I think, then I crawled my way to the final boss. No miss loop 1!, awful loop 2! Last edited by Vludi on Tue Jan 24, 2017 8:03 pm, edited 1 time in total. No miss loop 1. 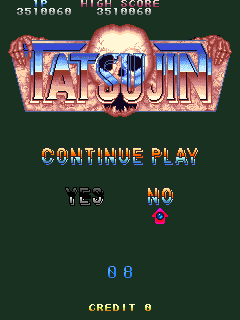 Almost got the Tatsujin 2-All, the final checkpoints are definitely nastier here than in Truxton. So the music being too fast was, in fact, a programming error and not something weird about the entire port. 50Hz boards removed, apologies to all involved players. The first picture shows my heroic battle against the final boss, on my last life, with no bombs left. I've wanted the 2-ALL for quite some time after getting so close before (I did not think that was over 1.5 years ago, though, tempus fugit...), but never managed to get a good rhythm again. Only two deaths in the first loop (one of which was quite frankly a scam, I had the red weapon fully maxed out and still crashed into a popcorn enemy), then the usual culling ensued. You really can't survive the second loop at maximum rank without bombs because bullets are so fast that you run out of screen space to dodge sooner or later. The real problem is that once you recover, the first speed-up comes immediately yet it takes a little eternity for the next one, meaning that despite the slower bullet speed by dint of lowered rank, you're still barely able to keep up. I strongly doubt the third loop is practically possible, even at lowest rank there is no way to not get trapped all the time. Expected it to end after the second loop just like the PCE Kyuukyoku Tiger (both are ported by Taito, after all), but Tatsujin actually goes on! Second loop is not that much harder than the first, the third loop on the other hand is fairly brutal, entered it with over 20 lives and didn't even manage to get to the fourth boss. I really love the ambiguous conception of the checkpoints - if you manage to survive long enough against most mini-bosses, they send you forwards instead of backwards, but then again the split-second a checkpoint starts angry enemies will blast the player. Great balance! Also played with every speed-up this time once I reached stage 3, it's slightly less natural in this version than in the other ports, yet it works nonetheless. Gotta get those bonus points! Also found some simple as well as elegant strategies against some bosses and mini-bosses. The only problem are those three guys in the final stage, it's the only place in the game where slowdowns can suddenly appear and subside, leaving the player open to a barrage of bullets. I would lastly wish that there was a way to tell how close bigger enemies are to dying in this version, those are all minor quibbles, however. Love this port, especially the music. 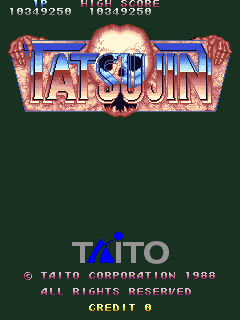 Tatsujin PCE is actually developed by Sting (Override). I'm not sure who developed the Tiger port. 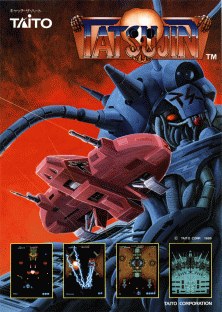 Both are published by Taito, but the K-tiger port was developed by A.I. who did the Raiden PCE ports among other things. How many speed ups do you guys typically use on your runs? Is it a case of the more the merrier? I think I used to limit myself to 2 or 3: is that enough? All of 'em, takes a while to get used but the game plays just fine with max speed. If you think it's too fast try 1 less speed up. I absolutely concur, that's phenomenal! Would also love to see your strategies and recoveries (if there were (m)any). When does the difficulty reach its peak from what you gathered? Is it the usual loop 3/4 threshold or does it rise afterwards? Thanks!, I'll try to record the whole thing, but as for now there is a INP that I uploaded to marp. As for the difficulty yes, it's the usual case where it maxes at loop 3 or 4, however even at high loops there will be a small rank decrease if you die (I suppose it's related to shot power). Got a bit tired so stopped at 4-1, haven't played Truxton in a while so this was kinda unexpected. From loop 2 onwards this is actually a really good port. 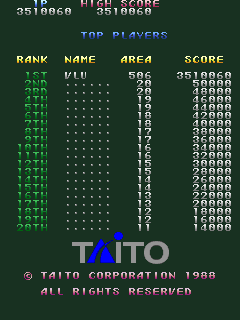 Maybe a bit easier than the arcade because the tatsujin laser slowdown helps quite a bit on (mid)bosses, but the final stage is harder than the arcade because it removes a bunch of checkpoints (I guess for balance purposes). By the way played fusaru's hack which looks a bit nicer, it has the same gameplay. Another run, this one on hard. The game gives you a staff roll and game over screen at the end of loop 5. I am not so sure I'm okay with allowing hacks just like that. I will take your word for it as this appears to just be a graphical hack, but I will clearly mark your scores and I ask you to use to use the original in the future, please. Jeez, Vludi, those are some mad runs! 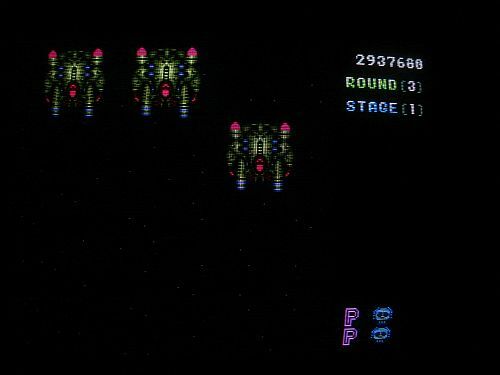 I don't know whether MD Truxton is considerably easier on higher loops compared to MD Tatsujin (I'd imagine not), but I found it almost impossible to dodge any sort of bullets in loop 3 since they are seemingly faster than your ship - your space is also limited, thus turning tapping/herding into lethal cul-de-sacs. Did you manage to apply your routes/strategies from your arcade marathon run or did you have to tweak them a bit? Thanks Perikles!, the strats are mostly the same as the arcade ones, there are a few different things like the boss 2 safespot which doesn't work anymore, but overall the port feels pretty similar to the arcade albeit a bit easier (full screen bomb, laser slowdown, accumulate power ups etc). 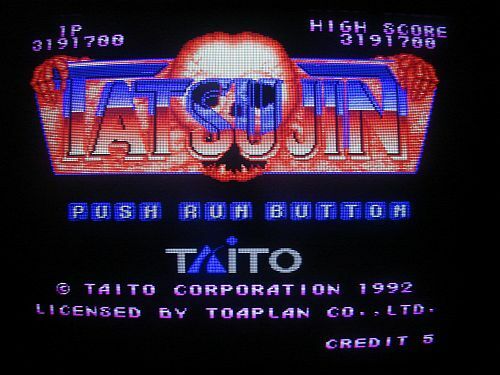 I'd like to test Tatsujin MD as well but no idea how to play that on a Genesis , maybe I'll give it a shot on emulator.